I’m starting this week off feeling thankful for the things I so often take for granted like cold air conditioning and hot water since we had issues with both last week. After a week of showering at the gym, a hot shower in our own home to get squeaky clean felt so good! And although the air wasn’t out completely (thank God), the issue has been fixed and now all the areas of our home are comfortable again in this 100-plus degree heat. 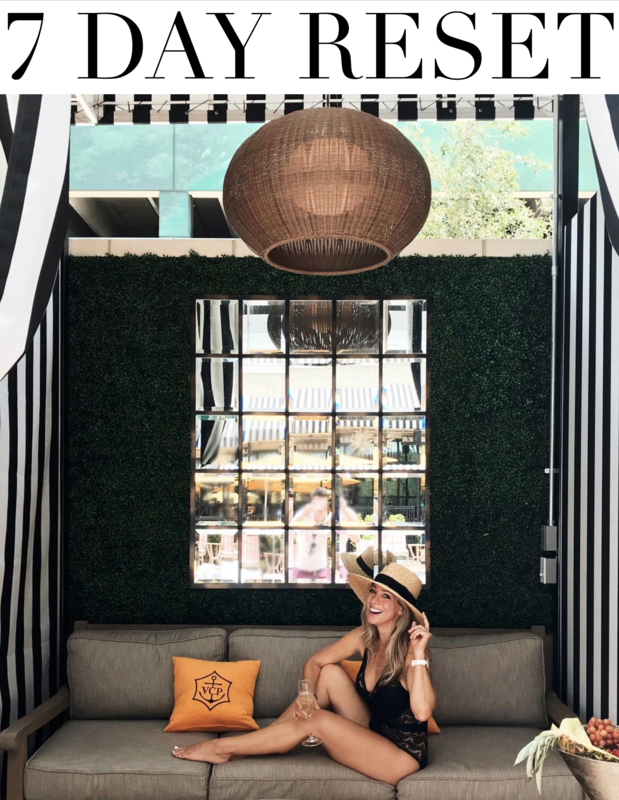 Houston is in the midst of a boiling hot summer and we won’t be getting relief any time soon, so we have to make the best of it! 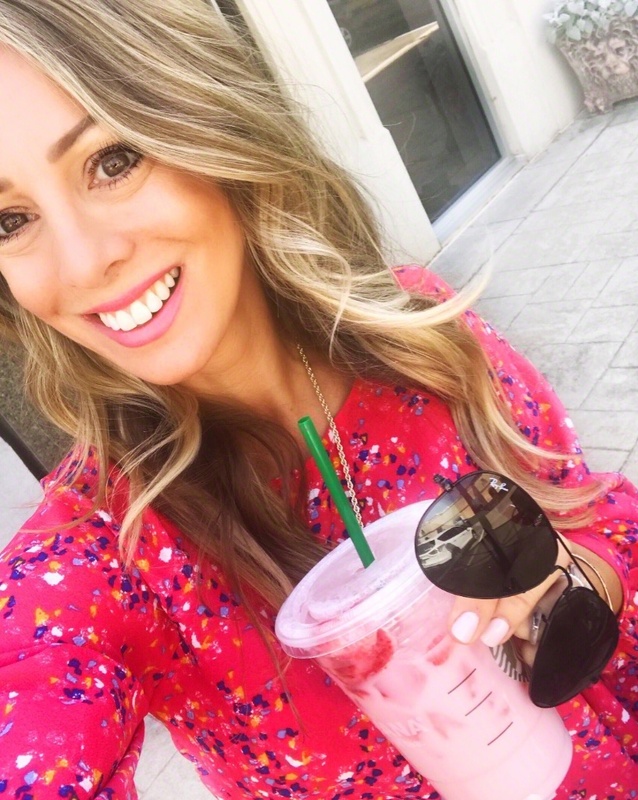 This week marks our return back to school and it’s surreal because it literally seems like just a couple weeks ago I was saying, we’re so excited for summer! I know blogging was light for that break, but now that James starts Kindergarten on Wednesday, I plan to get back to it. I’ve missed it! 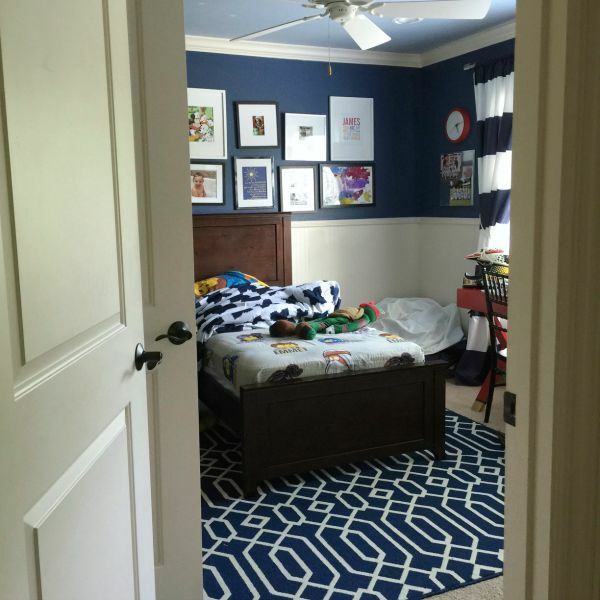 We’ve started transitioning James from his current room into the larger guest room with a bigger bed recently. It’s been a wonderful space for him over the years, as he moved in at just 4 months old. It began as a beloved nursery and then, as he got older, a fun big boy room. 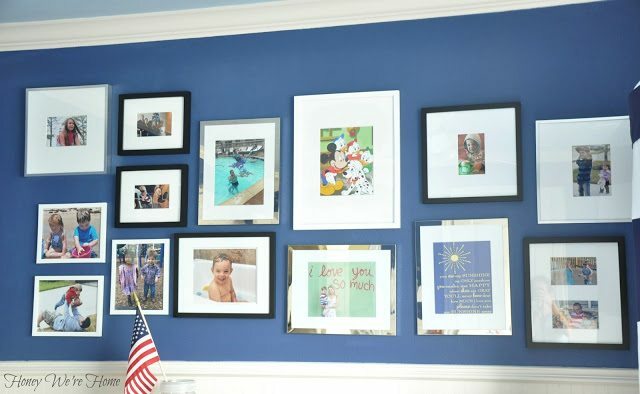 To bring you up to speed, I’m sharing pictures of his former room and how it evolved throughout the years. 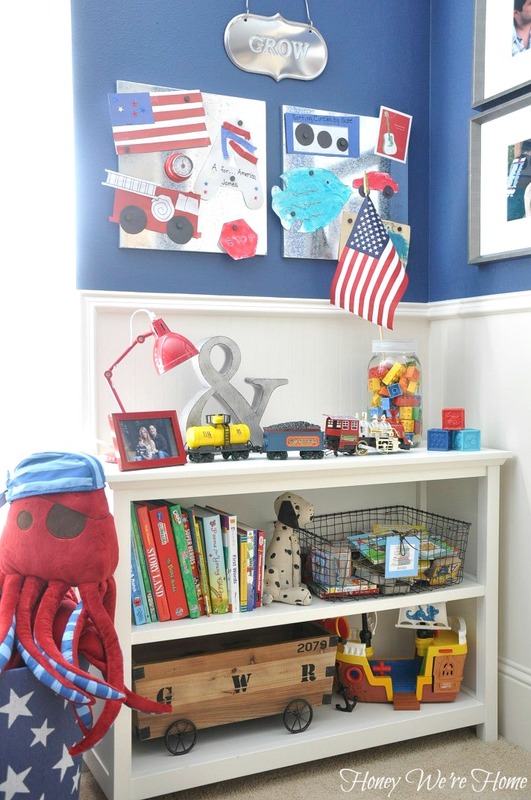 His room is a combo of dark blue walls (Benjamin Moore Indi-Go-Go color matched at Sherwin Williams) and light blue ceiling (Sherwin Williams Honest Blue) with pops of red. The blue and white stripe Rugby Play Tent Canopy was a super-cool place for him to hide away or for some reading time, and made for a fun eye-catching piece in the room. It’s made of durable polyester and is really sturdy. We hung it from the ceiling with a hook, but, as you’ll see later, it fell down when he and a friend were playing too rough. 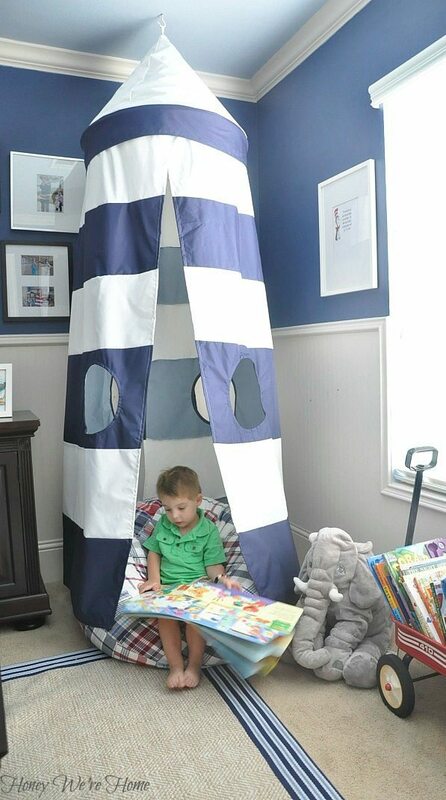 We plan to move the canopy to the playroom now. 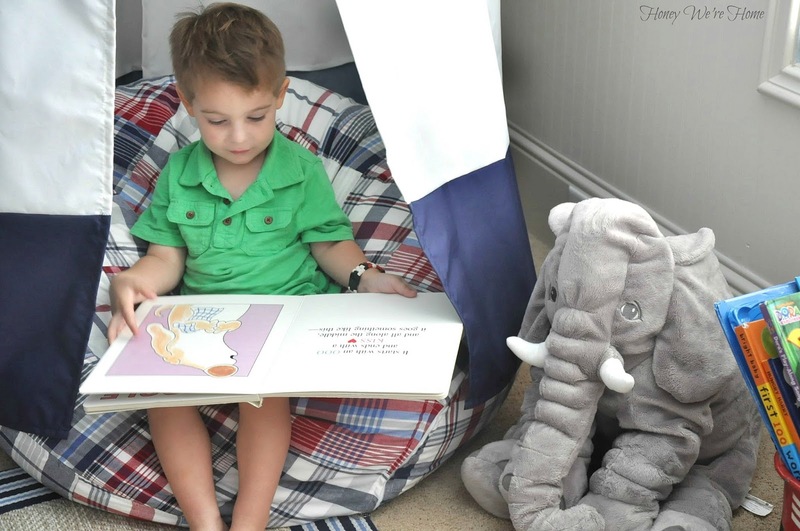 For cozy seating, inside the canopy is the Red Madras Anywhere Beanbag. At age 5 now, he still fits perfectly in it but sometimes he likes to bring it into the living room for seating while he plays video games. 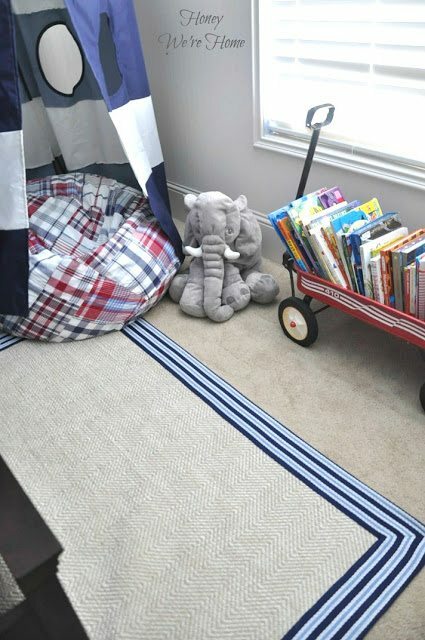 The Chenille Jute Stripe Border Rug ties it all together and is really soft. We are fortunate to have an old red wagon that belonged to James’ dad as a kid that is still in pretty good shape for being over 30 years old. After a good washing, it doubles well as added book storage. 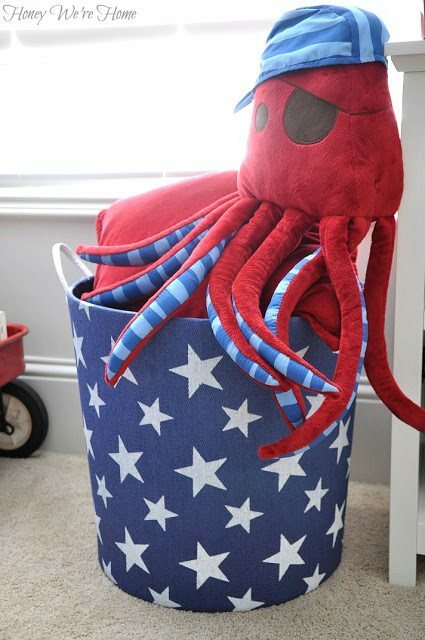 The big star bucket from Homegoods holds extra pillows and blankets for super cozy-time inside the canopy. Opposite the canopy is the Pottery Barn Cameron bookcase in white. I’m so pleased with the quality of this furniture, it has a solid wood frame and was easily assembled in about 20 minutes. I like to keep books as well as colorful decorative objects in the bookcase to mix it up. 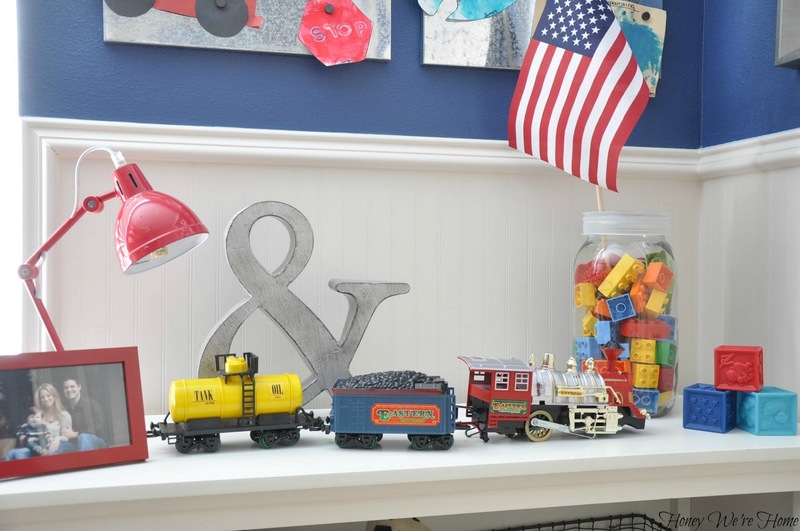 On display is part of James’ favorite train set from his Great Grandma on top along with the Solid Task lamp in red. 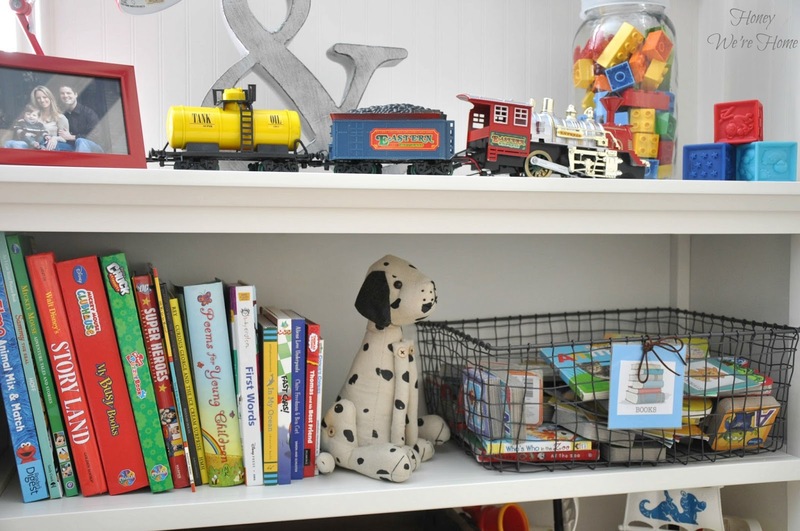 The bookcase holds lots of books and I included a wire basket that can easily corral the smaller board books. Making a label that James can “read” while still learning to read was easy with computer clip art and a laminating machine. It also makes clean up easy since James knows exactly where the small books belong. 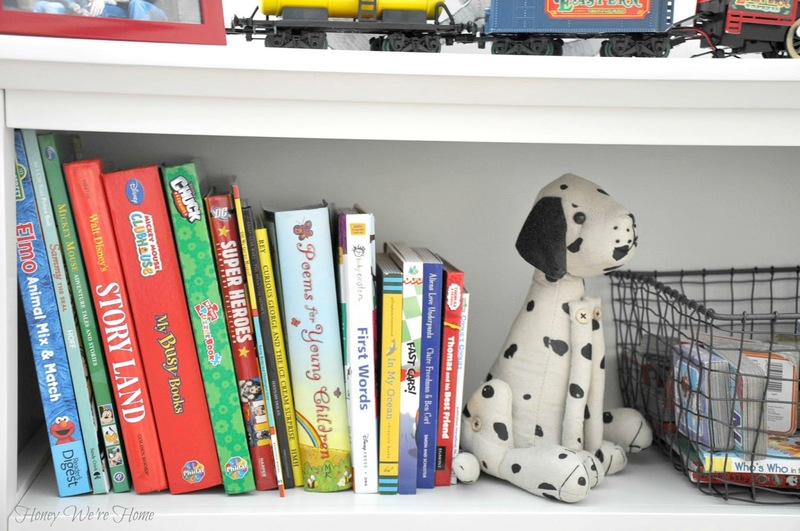 I adore this Dalmatian bookend. It’s surprisingly solid and keeps the books upright. So cute! The Galvanized Magnetic boards are perfect for showcasing James’ current art projects. 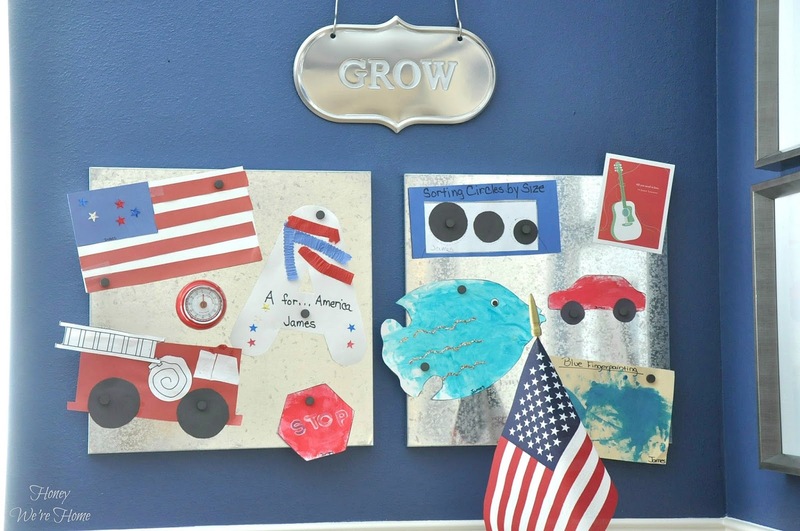 The “GROW” sign is meant for a garden, but I thought it was cute and appropriate for a child’s room. The drapes are actually West Elm shower curtains that I sewed added length onto the bottom to fit the height of the wall. I bought three curtains and used the third as the bottom length. White rope ties the drapes to the wall. 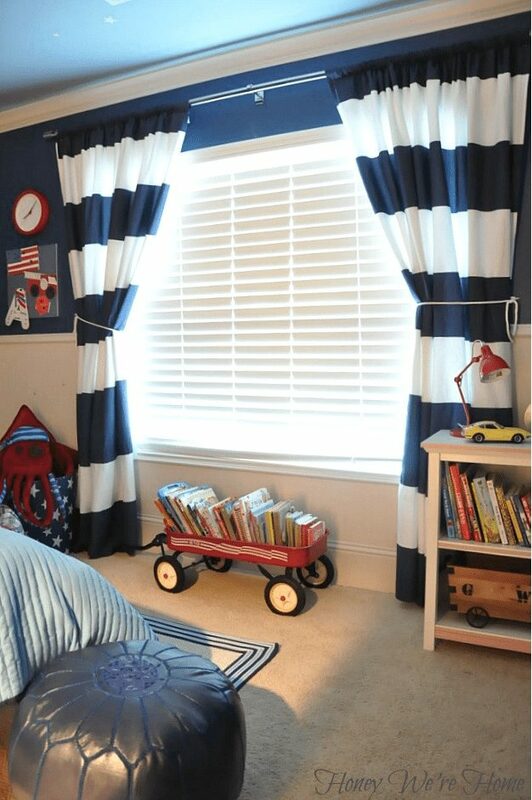 We used West Elm curtain rods as well. We have those rods throughout the house and my husband says installing them is a pain, but they look really sleek and nice. About a year ago, we moved the bookcase to the playroom and brought in the World Market Josephine desk in a red lacquer that is so bright and fun. 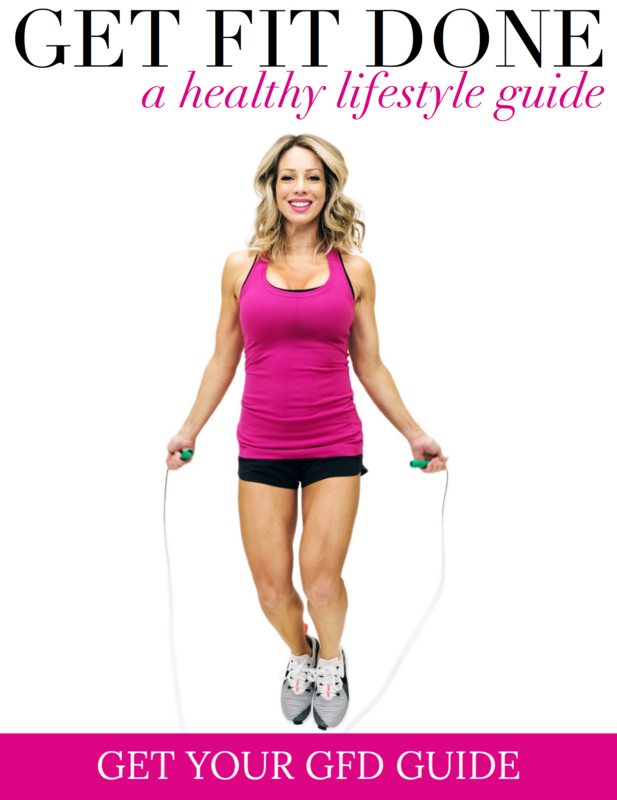 It happens to be on sale for $99 right now too! It’s a good size and has held up well so far. 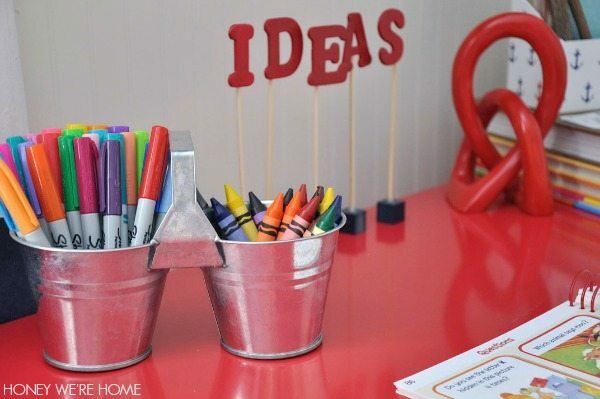 I made the “IDEAS” sign with wooden blocks, skewers, and chipboard letters. 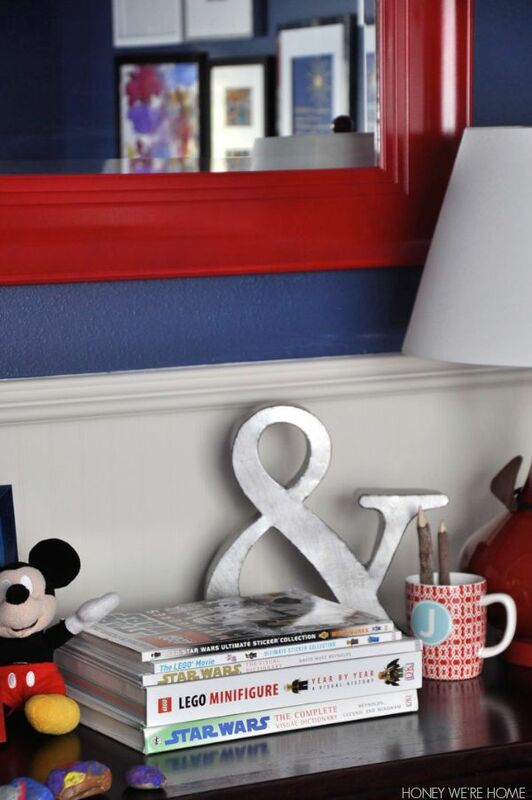 It’s an easy DIY that you can use for any word or perhaps your child’s name. The red sculpture is the Soapstone Love Knot Figure. 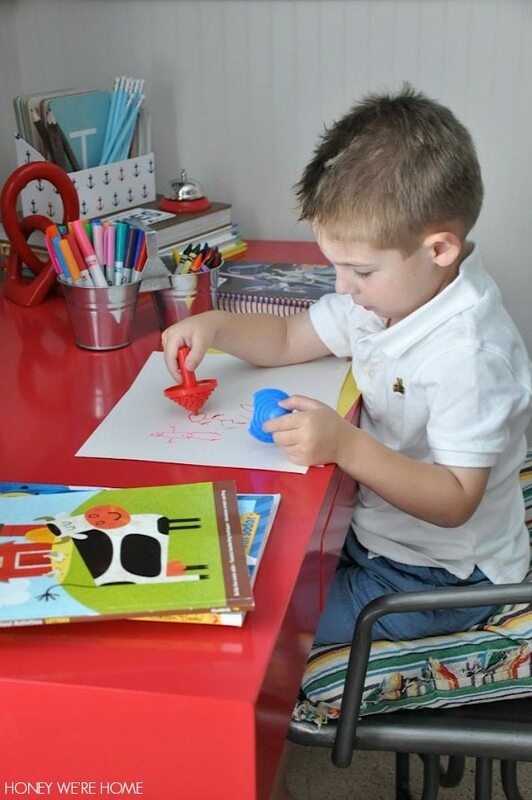 James loves “working” at his desk and I keep workbooks, coloring books, paper and crayons/markers in the drawer. 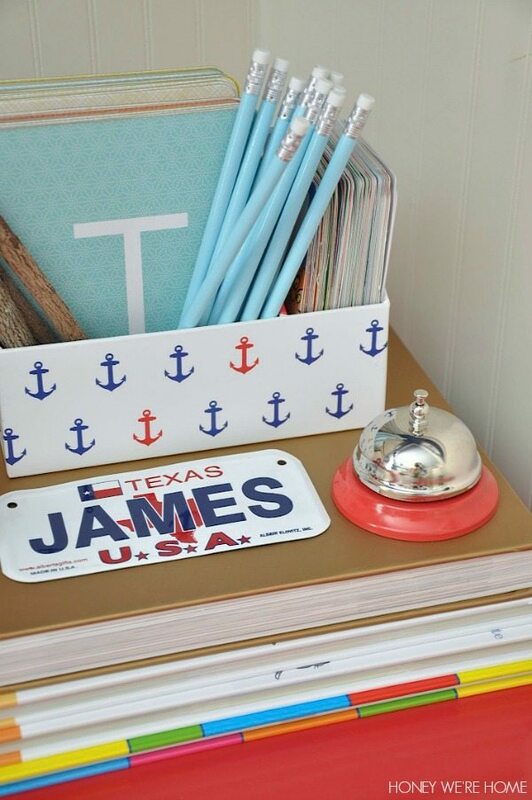 This desk should last him a long time since it’s stylish enough to grow through later years. Right now, he’s sitting on the multicolor striped frayed throw pillow and the Celia Metal Swivel Chair. 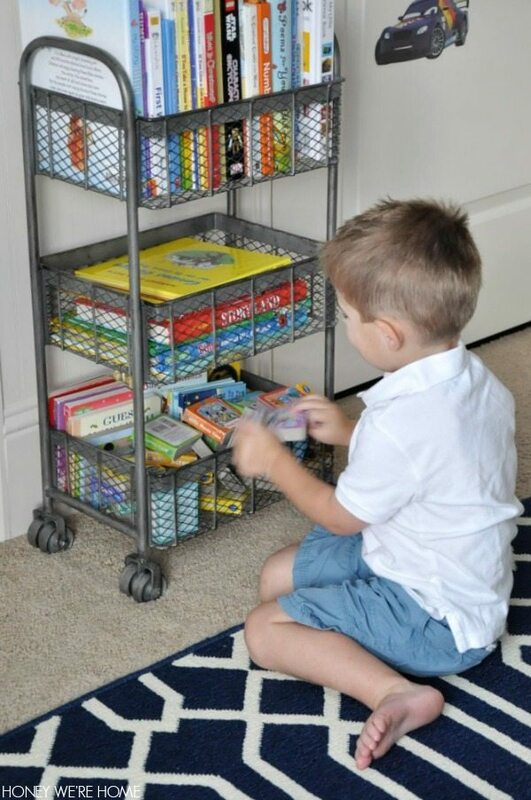 And since we moved his bookcase to the playroom to make room for the desk, I used the Zinc Oliver Rolling Cart as a three-tiered bookshelf that fit this small wall perfectly. Just his size! 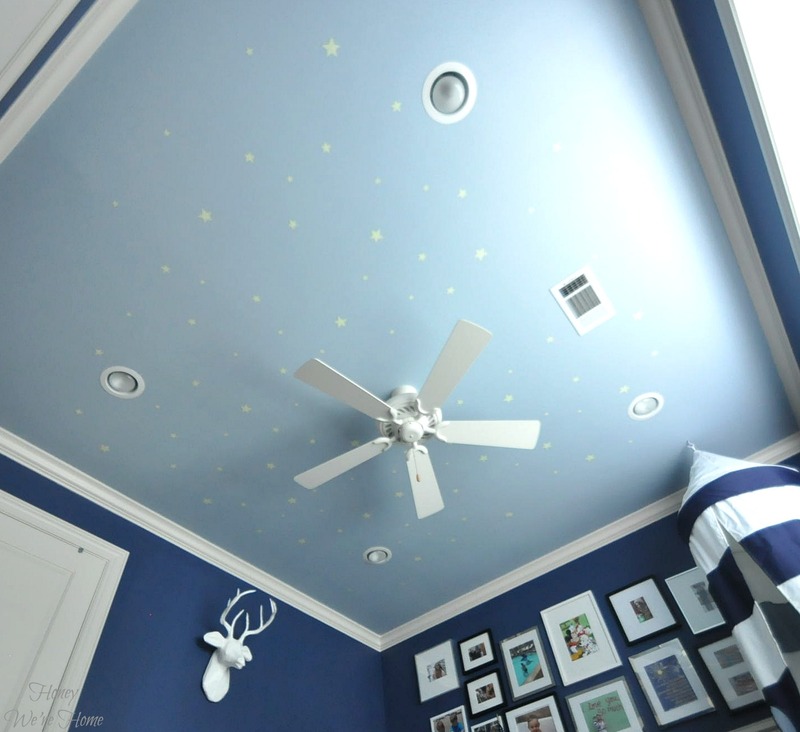 I liked how the star bucket mimicked the awesome glow-in-the-dark star decals we put on the ceiling. They really do light up the ceiling like the night sky when the lights are out! Later, we added a gallery wall full of favorite photos to the large wall adjacent to the window. 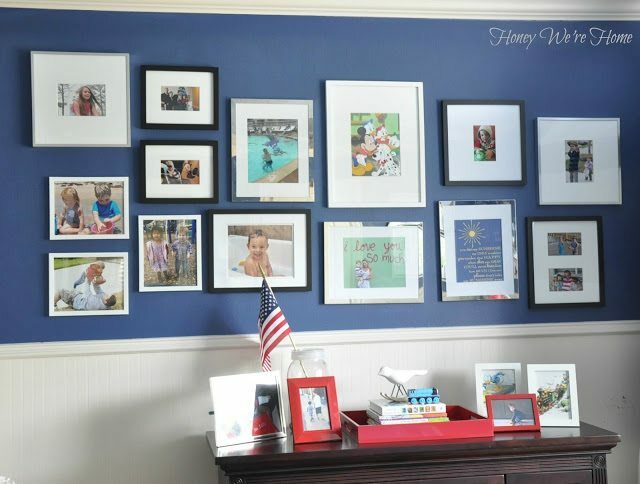 I’ve read many wise words about laying your frames out on your floor and arranging them how you like before you start nailing into the wall, but, as you can see, we didn’t do that. It was a little off, but I let it be as a reminder to keep things loose and not so perfect in this kid space. This twin bed (discontinued, but similar) replaced his crib and I ended up wishing we’d gotten a full size bed rom the beginning, just because we all tend to pile in there at night for story, prayer, and pillow talk so it’s super crowded. James fits okay alone, but he and I or he and Dad or all three of us in there is pretty ridiculous. 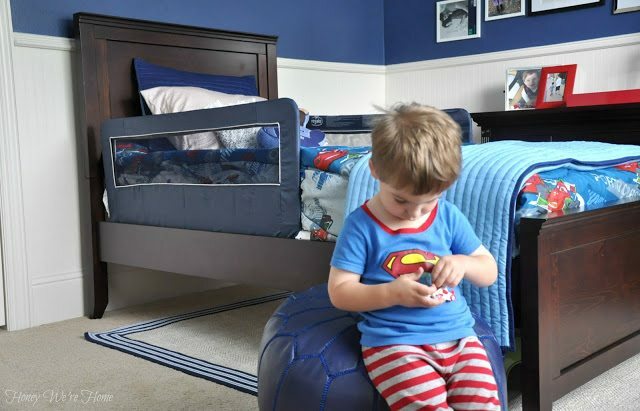 The safety bed rails weren’t required for long, but were useful while we needed them. Another change to the room was swapping the positions of the bed and dresser. 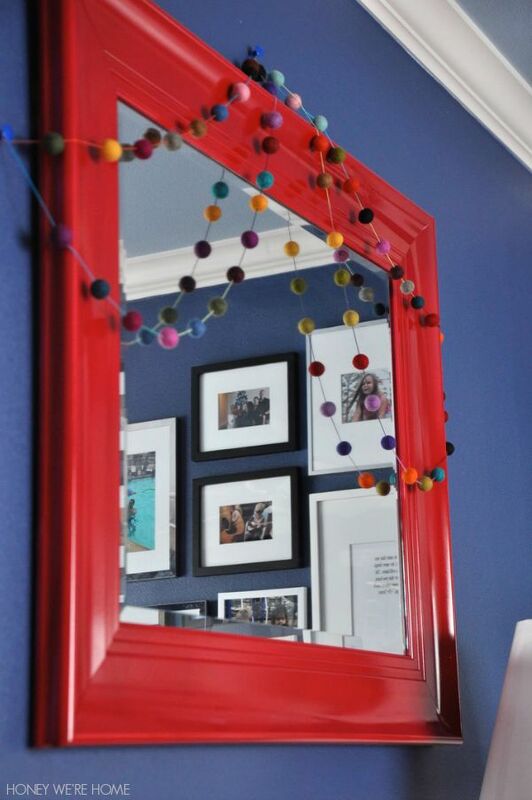 I also spray painted a silver mirror bright red to bring in more color and adorned it with colorful felt ball garland. 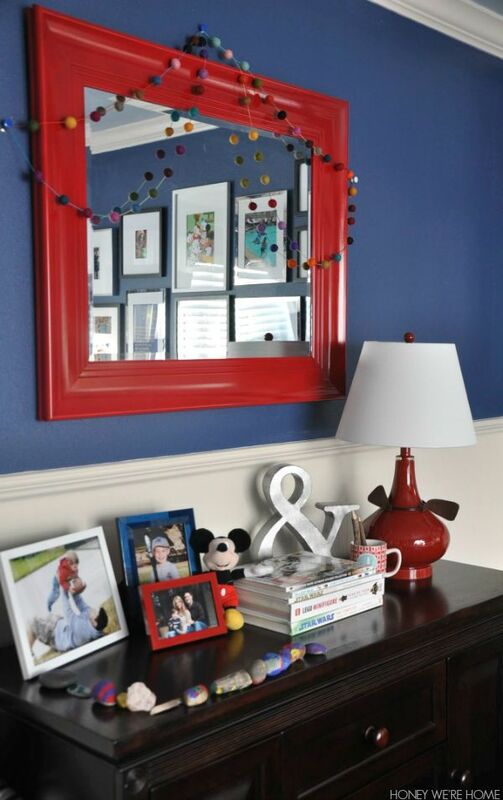 The mirror is dual purpose as it reflects the light from the window also. The red lamps and blue pouf are from Joss & Main. At the end of the day, this is how the room looked as I passed by recently. The larger geometric patterned rug is from Joss & Main. And, as I mentioned before, the tent had fallen and hadn’t been rehung yet. It’s bittersweet to be moving James from this room, but since we had a larger bed in the guest room already, and that room is bigger, this lucky guy is getting an upgrade. Just in time for Kindergarten! #hugme #imnotready! 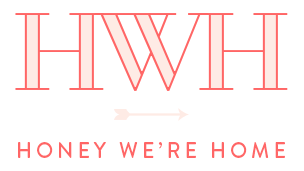 I’ll be excited to show you the new changes soon! Everything about this is so adorable. I especially love the canopy and the rolling cart. Oh how lovely! It's so vibrant and practical with so much storage. I love love that star ceiling! James is precious and I love his room!! 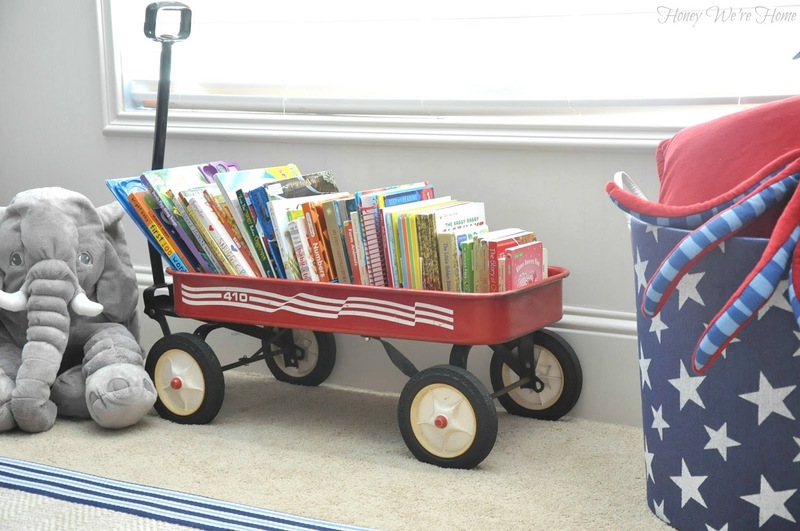 Love the books in the wagon – such a cute idea! OMG what a lucky little man! Such a darling and handsome space! Love all the special little touches. Kimdergarten can be difficult for parents, especially moms. Our church held a "tea and sympathy" get together this year for moms dropping their children off for Kimdergarten on the first day of school that went over well. Thanks for sharing the decorating changes to his room throughout the years. We started that at our school last year too and called it Tea & Tears. 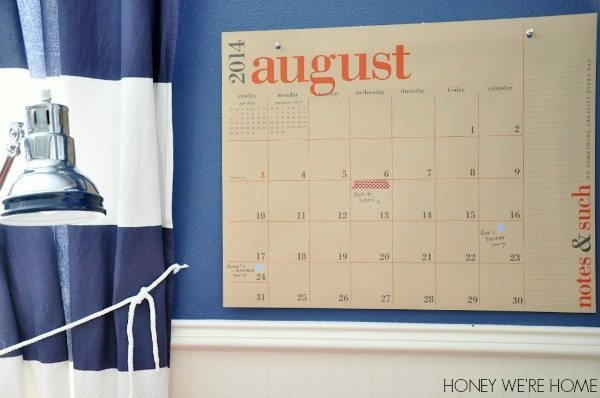 We know some parents are letting out a cheer over school starting and others are shedding a tear. I'm in the 'tear' category, but I know it's going to be a great year. My son is excited to start kindergarten. 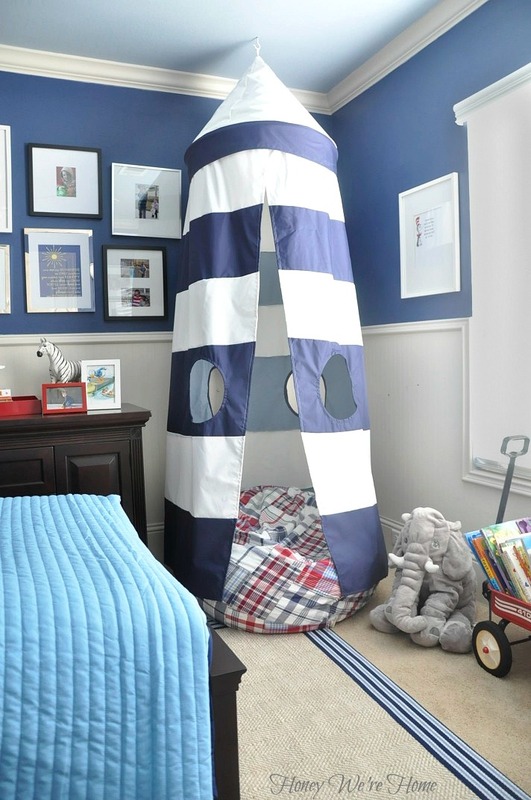 The room looks so adorable with the boyish blue and white theme. 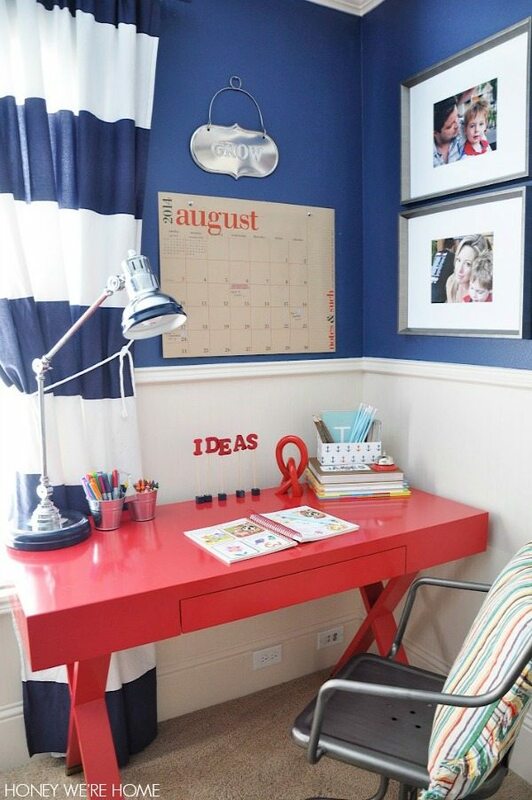 The colors are perfect and the room very well arrange. A simple yet beautiful home design. Regards Make my house. Hi Megan, I came looking through your old posts looking for down inspiration for my sons big boy room that we are re-doing. 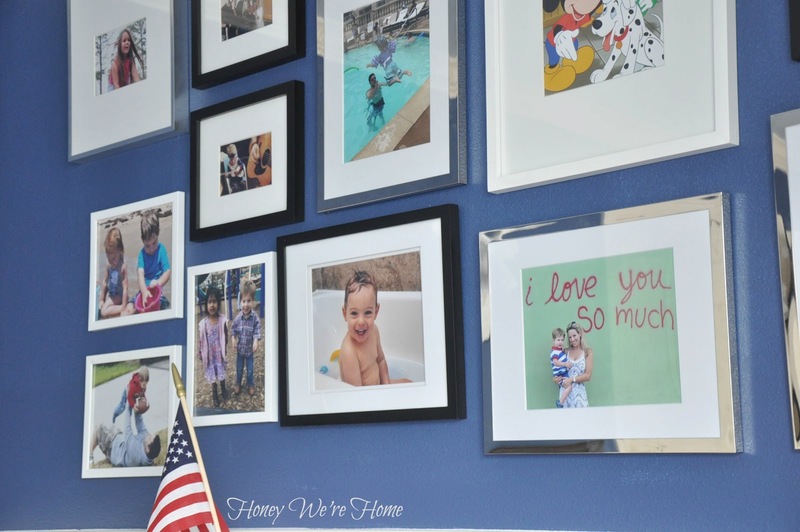 I couldn't find a post on your sons new room since he moved to the guest room…have you done one yet?